Writing, painting, fixing cars, or doing something creative in your spare time is a great way to keep your mind active and engaged, while improving your overall quality of life and possibly even delaying dementia. Having a hobby—something you do personally in your own time—helps improve your life in other areas, too. It can help you in both a personal and professional capacity and can provide you with a new set of useful tools. A recent report in the Journal of Occupational and Organizational Therapy shows that what people do in their personal time helps them in other areas of their lives as well. 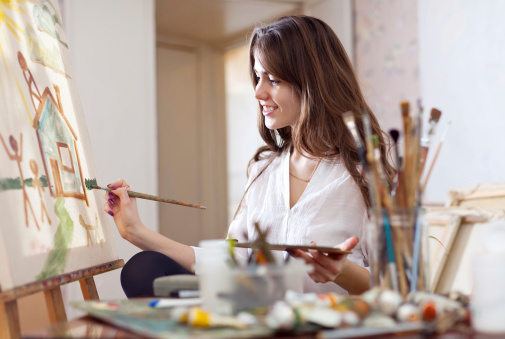 For example, a creative after-work hobby helps people recover from the stresses of their jobs, while improving their problem-solving skills and ability to think outside of the box when faced with a challenge. When people do something stimulating in their own time, they use their mind and engage themselves in a positive way. For example, if a person likes to write in their free time, they establish a connection with their thoughts and emotions, expressing themselves in ways that may not be possible through so many other aspects of life. In turn, this activity—or experience—allows them to further cultivate their personality, activate and stimulate their brain, engage themselves holistically, and develop skills and awareness to use in a variety of settings. Researchers surveyed 341 employees across America, asking them about their creative activities and their work performance. They also spoke to co-workers to rate a respondent’s job performance. The researchers discovered those who partook in a “creative activity” in their personal time were more effective in problem-solving and helping others on the job. The participants described their creative pursuits or hobbies as things they were deeply involved in that provided a great opportunity for self-expression and self-discovery. In turn, this affected the ways they thought about things on the job, how they interacted with others, and the ways they tapped into areas of the brain that they may not usually use for work. Having hobbies and creative pastimes will do more than just help people on the job. The sense of engagement and independence to think creatively and work things out independently will likely offer benefits in anybody’s day-to-day life. If you’re looking for a way to become more engaged and to sharpen your mind, finding a new hobby can be a great way to do just that. It can also be great for your mental and overall health! Preidt, R., “Creative Pursuits Might Boost Your Job Performance,” National Institutes of Health web site, April 17, 2014; http://www.nlm.nih.gov/medlineplus/news/fullstory_145738.html. Gray, B., “Lifelong Reading, Hobbies Might Help Stave Off Dementia,” Healthday web site, July 3, 2013; http://consumer.healthday.com/senior-citizen-information-31/misc-aging-news-10/reading-writing-may-help-prevent-dementia-677972.html, last accessed April 22, 2014.